Cindy Crawford Home Metropolis Microfiber Armless Loveseat Beauty and comfort are the signatures of the Cindy Crawford Home Metropolis microfiber armless loveseat. You'll love relaxing on this loveseat's soft microfiber fabric, and the deep-seated cushions conform to your body for extraordinary comfort. Beauty and comfort are the signatures of the Cindy Crawford Home Metropolis microfiber armless loveseat. You'll love relaxing on this loveseat's soft microfiber fabric, and the deep-seated cushions conform to your body for extraordinary comfort. I purchased this items with the couch and chase, the fabric has unstiched 2 times and now has ripped in another spot. We already had our couch replaced due to frame issues. Now the other pieces just don't match. I wish we never purchased these items for the price. I got 2 of these armless loveseats and a corner piece to create a sectional look. I love the versatility of these pieces. I could make one large sofa piece or create a sectional for any corner of my living room if I decide to change my layout in the future. Also, each individual piece has a finished look, meaning they can stand alone and also look great. The color is nice too. Slate is a grey color and the fabric is easy to clean and difficult to dirty. Everyone who sees it always asks where I got it and say they want to get one for themselves. Because I have 3 separate pieces, they do come apart sometimes and I have to push them back together. The cushions also get loose since I chose armless, so I have to put that back together too. This is a great addition to my home. Such nice quality. Great couch, very comfortable. Looks nice. Happy with my purchase. My husband and I bought this along with the right and left matching chaise lounges and created a custom living room set. It's in a U-shape. We love it. We've received lots of compliments on style and comfort. My dad even fell asleep on one of the chaises a few minutes after laying down..lol! And my husband enjoys it especially on Sundays while watching football. Very happy with this purchase. This couch set was way over budget for us but we just couldn't sacrifice the comfort and durability this had to offer. We got the credit card with 0% interest and have a whole year to pay it off. I'm hoping this couch last the next 14years, I couldn't imagine having any other couch! Just need to put our wall decor up! We painted the living room before the new couch arrived. I was initially hesitant about the color, because the color I wanted was not available. However, the color went beautifully with my décor and you can do many different things with the color. The couch is comfortable. I thoroughly enjoy this piece of furniture. Much bigger then it looks online. Had to go in store to really see the size and we love it. It's sturdy but forgiving, firm but squishy. Can be rearranged to become a very deep seat. Very beautiful furniture and high quality! I am happy with my decision making. Can't say enough about these couches. Absolutely by far and away the best I have ever come across. I purchased this and the 2 pc. sofa with chaste lounge. Superb comfort and so beautiful. I love my new sofa. It is comfy yet elegant looking. I have 3 dogs and have found that this sofa is very easy to clean. I love this sectional. It is comfortable, beautiful and high quality. This is a great loveseat to go with this set. It's nice enough to even use on its own! With a teenager in the house who has friends over, this set is great for moving around to accommodate them. Just love it! The product seems to be great - we are new to the product but if someone was seeking furniture, I would recommend they start with this product first. It caught our eye, satisfied our need for comfort and would appear to have longevity. I love it! It’s comfortable! I love this collection. We bought a new house and had been furniture shopping for a while. We saw this sofa collection on one of our initial shopping trips and I never found anything that compared and was never able to get it out of my head. We got this piece along with the sofa and ottoman to make a sectional. It is so comfortable and looks really nice. I love the cushions it comes with as well. Would definitely recommend. 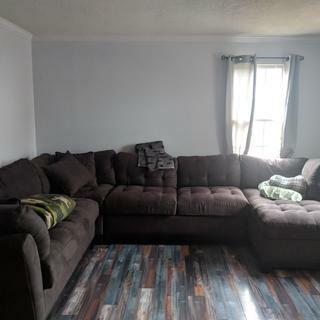 Is there an option to buy the loveseat with the arms? BEST ANSWER: The Metropolis collection doe not include a loveseat with arms. Can this be added to the 3pc sectional to extend it? BEST ANSWER: The Cindy Crawford Home Metropolis Microfiber Armless Loveseat can be added to other pieces of the Metropolis Sectional to extend it. How does the microfiber do with pets? Especially with cat claws?? BEST ANSWER: Microfiber is one of the easiest fabrics to clean and is recommended for those with pets. It is considered second for durability only to leather, however a cat could potentially mark it with sharp claws, as it would with any upholstery. What color is the wood of lower frame and legs of the sofa? BEST ANSWER: The wood trim is a dark espresso finish.